There is possibly no Mountain and Moorland breed that has enjoyed more of an upsurge of popularity over the last few years than the Highland. Originally bred on the Western Isles and parts of the Scottish mainland, there are now studs not only in Scotland but in many parts of England, Wales, Continental Europe, USA and Australia. More and more people are appreciating the wonderful temperament and the versatility of this, the largest and strongest of the native breeds. Perhaps the most interesting feature of the ponies' appearance is their wide range of colours, some of which are unusual and particularly attractive. In addition to the familiar greys, browns and blacks, there are a few bays and liver chestnuts, made especially eye-catching by silver manes and tails. The original colour is believed to be yellow dun, but there is now a great variation of other shades, including mouse, golden, grey, cream and fox. 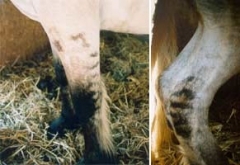 Most ponies of all colours carry a distinctive dorsal eel stripe, and many have zebra markings (stripes) on the inside of the forelegs. Apart from a small star, white markings are disliked and actively discouraged by the breed society. 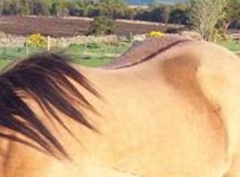 The flowing manes and tails are another characteristic of the breed, as is the silky, not over-heavy feathering, ending in a prominent tuft at the fetlock. Highland ponies vary in height from 13 hands to 14.2 hands and, although some of the smaller animals naturally tend to be lighter in type, they all should have substance, show eight to nine inches of good bone and be capable of carrying more weight than most ponies of similar size. In general appearance they are compact, with good fronts, shoulders and withers, strong legs and well-developed quarters. They must be of true pony type and not little horses.